For tickets, call the Fine Arts Hotline at (314) 968-7128. 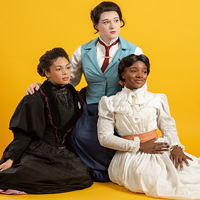 The Webster University Conservatory of Theatre Arts presents Anton Chekhov's "The Three Sisters," as adapted by Sarah Ruhl, Nov. 28-Dec. 2 and Dec. 5-9 in the Loretto-Hilton Center's Emerson Studio Theatre. Trapped in a provincial Russian town after the death of their father, three sisters lament the passing of better times and long for the excitement of Moscow. One of them has married a local teacher; another has become a teacher herself; the third has settled for a dull job in the local telegraph office. Their principal interest is focused on the officers of the local regiment, of which their father had been commandant, men who bring a sense of sophistication and the world outside to their suppressed existence. In the end the fateful pattern of their lives is made clear—their dreams will be denied but, despite all, there must always be hope, however futile, and the ways of the world are to be accepted, if not understood. For tickets to all Conservatory of Theatre Arts productions call (314) 968-7128.